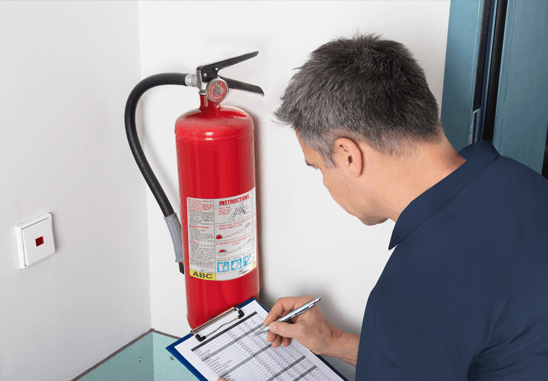 Essential Fire Extinguisher Maintenance | Alarm Detection Systems, Inc.
Portable fire extinguishers are the first line of defense in the event of a fire. Professionally trained and certified technicians will make sure that your extinguishers are suitably located, charged and are in proper working order. Alarm Detection Systems, Inc. (ADS) conducts inspections following OHSA/NFPA 10 codes along with other local, state and federal ordinances. ADS follows the National Fire Protection Association (NFPA) stating that all portable fire extinguishers be visually inspected on a monthly basis and maintained by a licensed fire protection company on an annual basis. The first step in following the correct testing program is to determine the type of extinguishers in your facility. Commercial properties commonly use ABC portable fire extinguishers due to the many types of fire hazards they cover. Class “A” Fires result from ordinary combustibles including paper, wood, cardboard or other items that leave ash. Class “B” Fires result from combustible or flammable liquids including gasoline, oils, and other accelerants. Energized Electrical Fires are known as Class “C” Fires. Our comprehensive services include more than “just” an inspection and tag. We address any repair or recharge of any extinguisher that does not meet the above requirements. Annual Maintenance visits will include removing the tamper seal and operating the pull pin. After the test, a new tamper seal is installed. ADS also ensures cylinders are full (by lifting or weighing them if possible). It is worth noting that ABC fire extinguishers require Hydrostatic testing every 12 years. Extinguishers receive this test to ensure they are still capable of maintaining the correct amount of pressure for discharge in the case of a fire. Alarm Detection Systems can help your business keep fire safety equipment functional and in proper order.